I've been joining several Christmas card swaps over on Inspire Swap Chat. While I usually don't use swapped cards for Christmas, there are some beautiful cards I've been receiving that I might be able to part with this year. Mostly I keep swapped creations to get new ideas from. For each swap I always make 1-2 extras for myself so by the time Christmas gets here I should have quite a stash of cards. 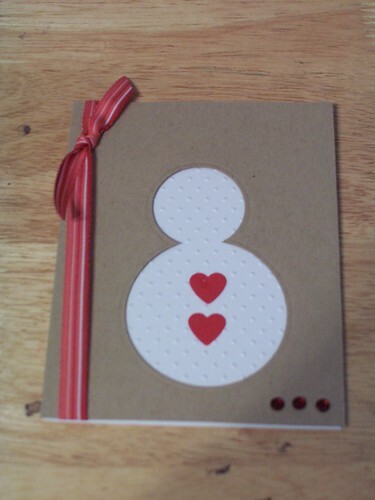 The August swap was to swap a card with a snowman on it. I have some cute snowman stamps but I wanted something different. I perused the gallery at Splitcoaststampers for a while and I saw a card similar to this but not exactly the same. I haven't found it again and I don't remember what the search parameters were. So no, I am not this creative but it has opened my eyes to new uses for the Nestabilities!